In total transparency, this was originally supposed to be a kid’s Halloween lasagna. I was going to put little olive slice eyes on top with a roasted red pepper tongue. Something ghoulish and Pinterest-worthy. Then, I realized, this isn’t necessarily a kid’s lasagna – it’s a healthier, gluten-free lasagna for kids and adults of all ages! I know you’re now bummed that there aren’t little eyes and red tongues, but hey, you can always do it yourself! Kind of like my eyeball spaghetti from a couple of years ago. This lasagna serves eight people and can be made in a large skillet or casserole pan. I used a large skillet for two reasons: 1) my casserole dishes haven’t arrived to the new office yet, and I was too lazy to run upstairs and grab one from our apartment and 2) the round sweet potato slices work well in a round skillet! 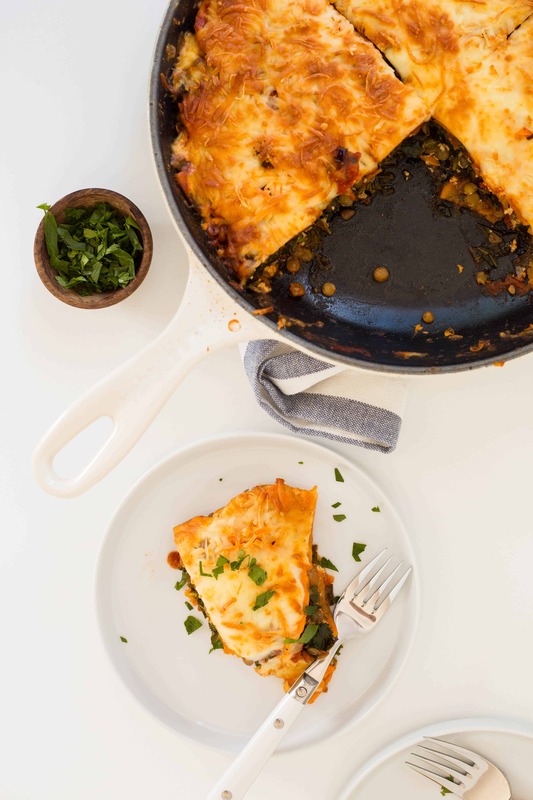 This lasagna uses Victoria Fine Foods’ new Avocado Marinara, made with – you guessed it – avocado oil! 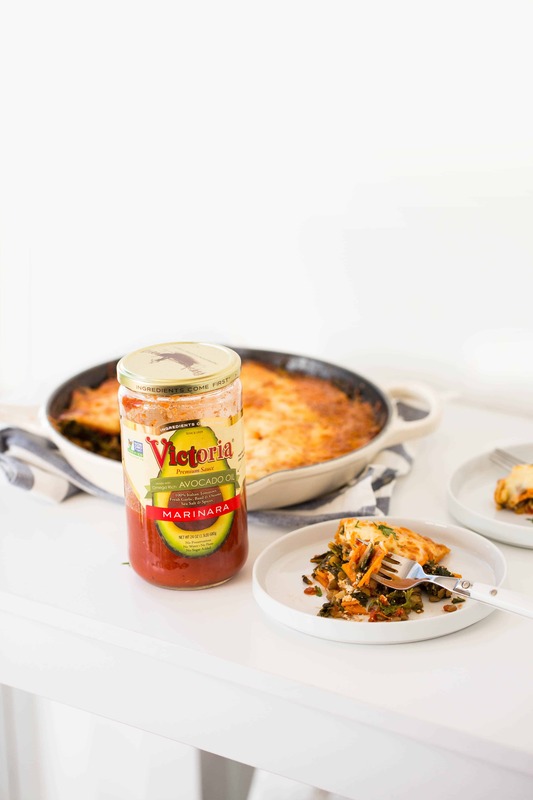 Victoria recently came out with this marinara sauce, made with antioxidant and omega rich avocado oil. If you didn’t know already, avocado oil provides essential fatty acids and unsaturated and Omega 6 fats, which are both essential nutrients needed when you have a vegetarian or vegan diet. 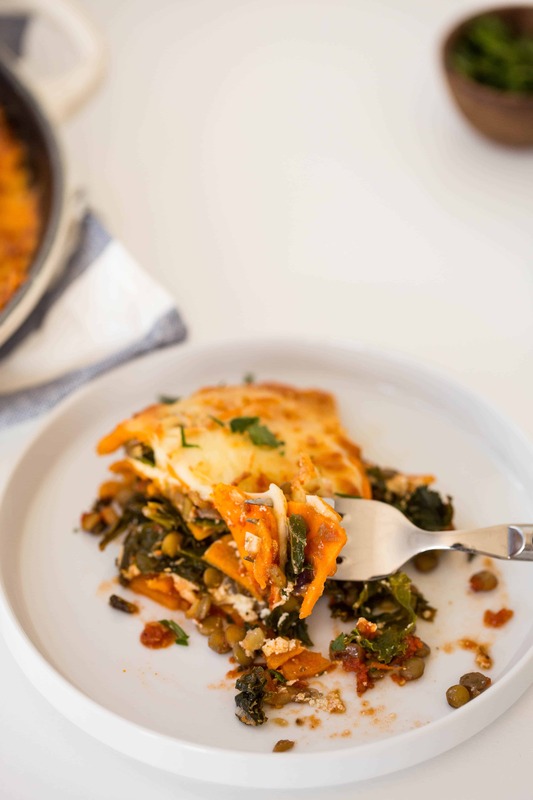 It only made sense to use this new marinara in this vegetarian lasagna! So, Halloween is my favorite holiday. I know, I know – it’s not exactly a significant holiday. I mean, I love Christmastime, don’t get me wrong, but there’s something about Halloween that has always got me. I think because I was a huge Buffy the Vampire Slayer fan in my adolescence, that I’ve always had a fascination with demons, vampires — geez, I sound like SUCH a nerd. Welp, guess I am a nerd- because I still have my Buffy DVD collection, and whenever I need a pick-me-up, it’s straight to Season 1. I love the weather, I love the time of year, I love gummy worms in dirt and hot dog mummies – I love.it.all. Unfortunately, my husband does not have the same love for Halloween as I do. His birthday is October 30th, so like someone born on Christmas or Christmas Eve, it’s kind of a bummer – every birthday had to be a theme party, I guess. SOUNDS LIKE MY DREAM. Maybe we should swap birthdays. 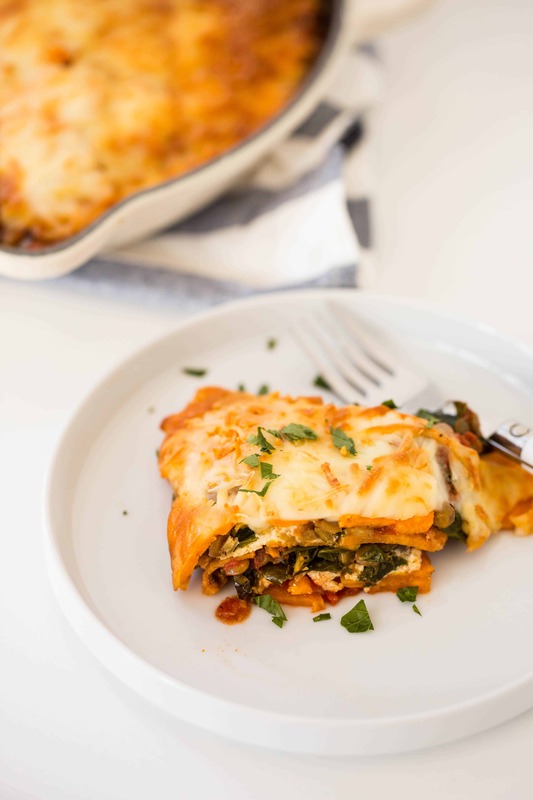 Anyways, regardless of your feelings on Halloween, this vegetarian lasagna is sure to make your weekly dinner rotation – it saves well, is packed with nutrients, and comes together quickly. Note: This post was sponsored by Victoria Fine Foods, but all opinions are my own, always. Prepare the sweet potatoes. Peel the potatoes. Spiralize with Blade A. Place a large skillet over medium heat and add the oil. Once oil is shimmering, add in onions and let cook until translucent, about 3 minutes. Add the garlic, red pepper flakes, and kale, season with salt and pepper, and cook for 3 more minutes or until kale mostly wilts. Add in the cooked lentils, season with oregano, and stir to combine. Add the ricotta, parmesan and egg to a bowl. Season with salt and pepper, whisk together and set aside. Gather all of your prepared ingredients. Add 1/2 cup of the tomato sauce to the bottom. Then, add a layer of sweet potato noodles. Then, add a layer of the ricotta mixture. Then, add a layer of the lentil and kale mix. Then, add in 1/2 cup of tomato sauce. Then, add a layer of the sweet potato noodles. Then, add in a layer of the ricotta mixture. Then, add a layer of the lentil and kale mix. Then, add 1/2 cup of tomato sauce. Then, add a layer of the sweet potato noodles. Then, add in a layer of the ricotta mixture. Then, add a layer of the lentil and kale mix. Then, add in 1/2 cup of tomato sauce. Then, add a layer of the sweet potato noodles. Then, top with all of the mozzarella cheese. Cover the casserole dish with tinfoil and bake in the oven for 40 minutes. After 40 minutes, the sweet potato should be fork tender. If it’s ready, take the dish out of the oven, remove the tinfoil top, and garnish with parsley. Carefully cut the lasagna into 8 equal portions. Remove these portions and plate immediately or save in individual containers in the refrigerator (or freezer). Amazing, how did you know I have these exact ingredients and was trying to figure out what to do with them?! Lu and I share a birthday! It's great to be an October baby. This recipe looks great - I will make it without the Halloween extras. Could I do this with butternut squash instead of sweet potatoes? If so, about how much do you think I would need? Yes, definitely you could! I think 1 large butternut squash would do the trick! Hi Ali, is there a way to make this dairy free? I am also a huge fan of Halloween, so I would love eye balls on here!! Vegetarian lasagna has always been one of my favorites, even when I ate meat. I will definitely be trying this recipe out! This is so delicious! I thinly sliced potatoes with mandolin, used closer to 2 cups of lentils, a whole container of ricotta to which I added fresh parsley. I used 2 whole containers of kale/greens mix, processed til finely chopped. I will definitely make again, my husband and I ate nearly half the pan and look forward to the leftovers! Thanks for such a great recipe. This was soooo good. We just made it tonight and it tasted better than some traditional lasagna recipes we've tried. Awesome idea using sweet potatoes as noodles! Hi Stacy! This is so great to hear! Thanks for your support!